The International Traffic in Arms Regulations applies to manufacturers in the U.S. who fabricate and export defense articles including items, services, and technologies on the United States Munitions List (USML). These regulations are put into place to ensure that U.S defense-related technology doesn’t get into the wrong hands and that said parts are manufactured with the quality and precision required to protect our people and places. ITAR requirements and regulations apply not only to the manufacturer but also their supply chain as well. Companies in the U.S and overseas are increasingly using the ERP software to track the ITAR controlled items through the supply chain. When a business is trusted and approved for defense-related manufacturing it means they’ve proven their reliability in both internal processes and fabrication capabilities for external uses. Bracalente has years of experience, company owned manufacturing facilities both here and abroad. 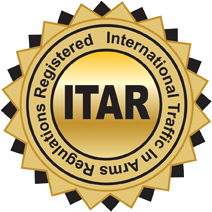 We understand the criticality and sensitivity of ITAR regulations. Our integrated ERP system and technology control plan ensures compliance, protection and uniformity with our own US based high standards. It can be tempting for companies to search for a manufacturer overseas, especially with lower labor costs and promises of a quicker turnaround. When working with overseas manufacturers, however, there’s a lack of information regarding the materials used in production and an increased chance of lower quality final products. Companies also run the risk of intellectual property falling into the wrong hands or counterfeit items being manufactured and labeled as genuine, potential issues that become especially problematic when dealing with military and defense products. Even some domestic manufacturers serve as nothing more than a front to send their products overseas and produce similarly low-quality products; this is simply not an option for military or defense items, making it essential to select an ITAR registered manufacturer for your production needs. Bracalente submitted a packet to the Defense Trade Controls Compliance (DTCC) and went through an extensive registration process to become accepted by ITAR. The certification process included refining of our technology control plan and validating our auditing/record keeping practices. These required updates have also helped us to further improve our manufacturing techniques across all industries – not just for our military and defense products. Rest assured that Bracalente becoming ITAR registered is not just a ‘one and done’ procedure. Once a company is registered, the U.S government is very stringent on enforcing these regulations and making sure companies are compliant, even famously imposing a $100 million penalty to a company found to illegally re-transfer night vision technologies. We’d rather spend that money expanding our capacities and continuing to expand the manufacturing prowess that has made Bracalente a globally renowned fabricator and distributor. To learn more about our capabilities and equipment, view our Full Equipment List. To discover what we can do for you, contact us today or visit our website for more information.